David Kalakaua was born on November 16, 1836, and as was Hawaiian custom he was adopted by the chiefess, Haaheo Kanui, who took him to the court of King Kamehameha III on the island of Maui. When he was four he returned to Oahu to begin his education at the Royal School. He was fluent in English and Hawaiian and began studying law at the age of 16, but was unable to fully complete his legal training because of the various government positions he held. When Kamehameha V died in December 1872 he had not designated an heir, so an election was held to determine his successor. Prince William Charles Lunalilo was victorious over David Kalakaua by a wide margin. However, on February 3, 1874, Lunalilo died without naming a successor and Kalakaua was elected King. King Kalakaua traveled to the United States and negotiated the Reciprocity of Treaty of 1875, which eliminated the tariff on sugar and other Hawaiian products and as a result, Hawaii’s sugar industry boomed and the kingdom enjoyed a period of economic prosperity. When Kalakaua returned to Hawai’i he moved into his palace with his wife, Queen Kapiolani. He had Iolani Palace built at a cost of $350,000 which was an unheard of sum at the time. So much so, that the palace was equip with electricity before The White House. Iolani Palace is the only royal palace that exists on American soil today. He named his brother, William Pitt Leleiohoku, as his heir, putting an end to the era of elected kings and also started off his reign with a tour of the Hawaiian Islands which improved his popularity. At one point his took a trip around the world to study the matter of immigration and to improve foreign relations, but he also wanted to study how other rulers governed. King Kalakaua’s health began to fail by 1890 and under the advice of his physician he traveled to San Francisco. 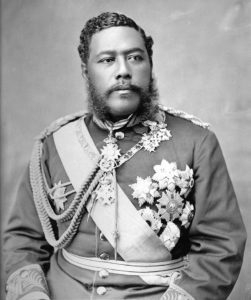 His health continued to worsen and Kalakaua passed away on January 20, 1891 at the Palace Hotel in San Francisco. His remains were returned to Honolulu aboard the American Cruiser, USS Charleston, but because he and his wife Queen Kapiolani did not have any children, his sister, Lili’oukalani succeeded him to the Hawaiian throne. King Kalakaua earned the nickname “the Merrie Monarch,” because of his love of joyful elements of life. Under his reign, the hula was revived, which had been banned by the missionaries in the 1820s after being deemed immoral. He also had a passion for music, dancing, parties, and the finest food and drinks. King Kalakaua, along with his brother-in-law John Owen Dominis, established the Ancient & Accepted Scottish Rite in the Hawaiian Islands in 1874. Both Kalakaua and Dominis were the first 33° Freemasons in the Hawaiian Islands. In 1874, King Kalakaua served as the first Wise Master of the Chapter of Rose Croix. In 1880, Kalakaua was bestowed with the Grand Cross of the Court Honor, the highest individual honor that the Supreme Council of the Scottish Rite of Freemasonry can bestow. Until 2013, King Kalakaua was only one of two members to receive the honor in Honolulu, Hawaii.